Ava accuses Griffin of taking Kiki&apos;s life and pulls the gun on him. Griffin swears his innocence, but Ava says he betrayed her and she&apos;s going to make him pay. Griffin denies everything, but Ava says he&apos;s still responsible for their estrangement. Ava says she never got a chance to make things right with Kiki. Griffin tells her she&apos;s taken everything from him and to go ahead and shoot him. Alexis wants Griffin arraigned so she can get him out on bail, but Margaux&apos;s not in a hurry. Alexis says he didn&apos;t kill Kiki, but Jordan says the investigation is ongoing. Jordan admits to Margaux that she doesn&apos;t believe Griffin is guilty. Julian tells Kevin he&apos;s worried what Ava would do and she&apos;s thinking about revenge. Julian and Ryan head to the station to stop Ava from shooting Griffin. Ryan tells her she&apos;ll feel a brief relief when she shoots him, but she&apos;ll ultimately will lose. Ava lowers the gun. Chase finally shows up in the interrogation room. Ryan claims all Ava wanted to do was confront Griffin. Valentin doesn&apos;t want Sasha to leave because he&apos;s getting closer to Nina. Sasha doesn&apos;t want to talk to the police. Nina shows up and says she&apos;s contacted Diane. Chase shows up to take Sasha in for questioning. Sonny tells Carly that Ava should be the one to tell Avery about Kiki. 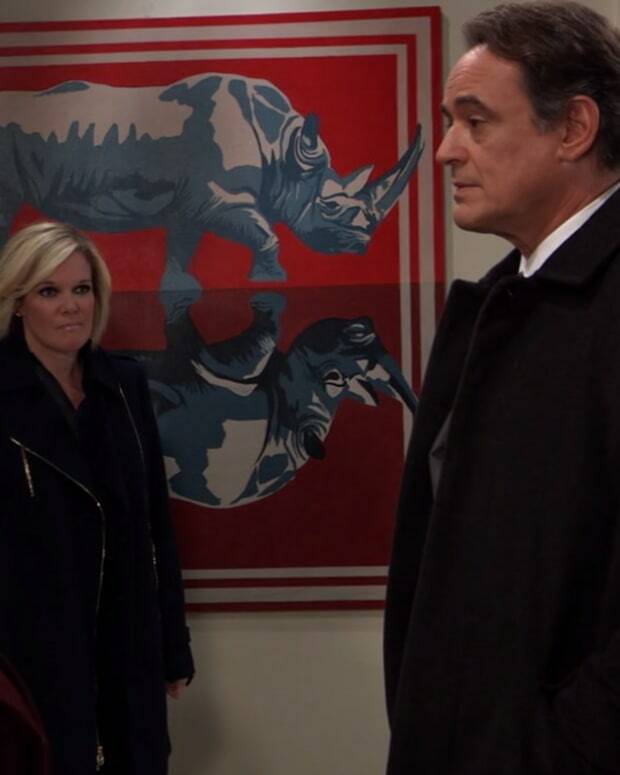 Sonny tells her Griffin was arrested. Carly admits seeing them having a fight at the hotel, but doesn&apos;t feel like it&apos;s something Griffin would do. Jason tells Sam he talked to Drew about Oscar&apos;s drug trial. Sam&apos;s happy the brothers are getting along. Alexis arrives with soup for Sam&apos;s cold, so Jason leaves. Alexis tells Sam about Kiki&apos;s death. Sam gets an obituary sent to her for Leland Powell. She tells Alexis that he was her husband. Nina accompanies Sasha to the station, but Jordan kicks her out. Nina&apos;s upset with Curtis for telling Jordan about Sasha. Jordan interviews her. Sasha explains she flirted Griffin and it upset Kiki. Sasha tells her about being drugged and left in bed with Griffin. Sasha says Griffin and Kiki blamed Ava, who wanted revenge. Jason tells Sonny and Carly that Margaux&apos;s mother hasn&apos;t been charged with conspiracy. Sonny&apos;s no longer worried about Margaux despite Carly&apos;s bloodthirsty need to drag Jeanette into the gutter. Carly tells Jason that Griffin was arrested. Jason can&apos;t believe it since Griffin helped him in Russia (you know, right after Ava helped him in Russia). Carly doesn&apos;t believe Griffin is innocent either, and worries the real killer is still out there. Carly brings up Oscar. She&apos;s not amused to find out Jason knew about the brain tumor for months and didn&apos;t tell her. Carly worries about Joss and how she will react if the worst happens to Oscar. Jason reassures her. Sonny goes to Morgan&apos;s grave (Morgan&apos;s dead, in case you hadn&apos;t heard) to tell him about Kiki&apos;s death. Sonny hopes that Morgan and Kiki look after each other. Margaux runs into him at the cemetery. Valentin wants Sasha to stay at Wyndemere until the murder is cleared up. Nina offers to stay there as well. Jordan tells Curtis that TJ is taking things very hard. Curtis says he doesn&apos;t believe Griffin is the killer and Jordan agrees. Jordan says Sasha&apos;s testimony pointed her to a new suspect.